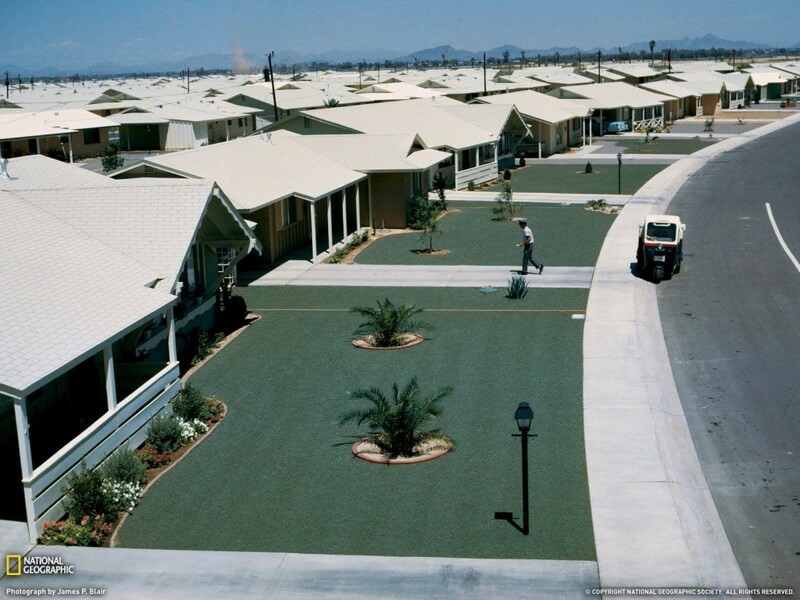 Photo of a Sun City Leisure Lawn included in a March 1963 National Geographic article on Arizona. 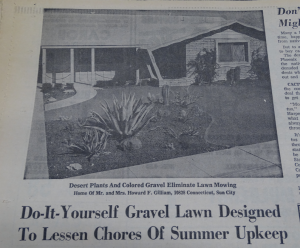 Headline and photo from a February 23rd, 1963 Arizona Republic article on Leisure Lawns. 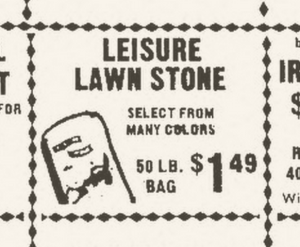 A 1968 Arizona Republic ad for Leisure Lawn Stones. 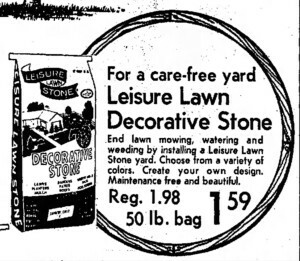 A 1972 Arizona Republic ad for Leisure Lawn Stones. Arizonans who have driven through Sun City, Mesa’s Leisure World, Pima County’s Green Valley, or any number of mobile home parks throughout the Phoenix, Tucson, and Yuma metropolitan areas have likely seen many such lawns, which appear verdant year-round regardless of temperature or rainfall levels. The rich green color of these lawns is not the result of a Space Age turf-greening technology developed at one of the state’s universities. Rather, it is a material no more technologically advanced than the pet rock was biologically innovative — painted rocks. 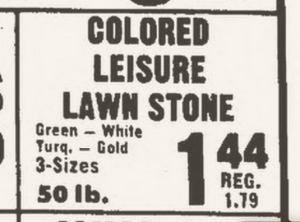 A 1973 Arizona Republic ad for Leisure Lawn Stones. Leisure Lawns came about as a product intended to serve as a low-cost, no maintenance lawn that that could withstand the brutal Arizona sun, thrive in times of drought, and render lawn mowers obsolete. Though now little more than a kitschy relic of Arizona’s mid-century retiree influx, Leisure Lawns were once quite popular throughout the warmer regions of the Grand Canyon State. A 1976 Arizona Republic ad for Leisure Lawn Stones.